Uncomfortable – adj. A state of mental or physical discomfort, ill at ease, distress. Or it may be illustrated by being the only two white Americans on a bus full of Arab Muslims as they show the movie “Delta Force” with Chuck Norris. For those of you who may not be familiar with this particular film. Arab Muslim Jihadists hijack an American plane and take it to Beirut. Ultimately the Jews are separated from everyone else and the men are all held hostage somewhere in Beirut. The Delta Force, led by Chuck Norris and Lee Marvin of course come in and save the day, wasting untold numbers of Arabs. The climax of the movie is when the liberated plane with the hostages lands in Israel and is greeted with a crowd waving hundreds of US flags and singing “God Bless America”. Jack and Nancy Snyder with granddaughter Alyssa, Diana, Bekki and I. Jack and Nancy have been in Tchad almost 30 years and have been some of our mentors. As we close out our ministry here in Tchad we have had a wonderful weekend of fellowship with the dear friends we have made here in Moundou and in N’djamena. Missionaries who truly humble me with their dedication, their love of Jesus, and their willingness like the Apostle Paul to suffer whatever hardships they are called to in order to tell the world of Jesus. Missionaries from all different Christian denominations, who have truly blessed us and honored us with their friendship and ministry. We pray that we will find more brothers and sisters in Christ like them in Sierra Leone. 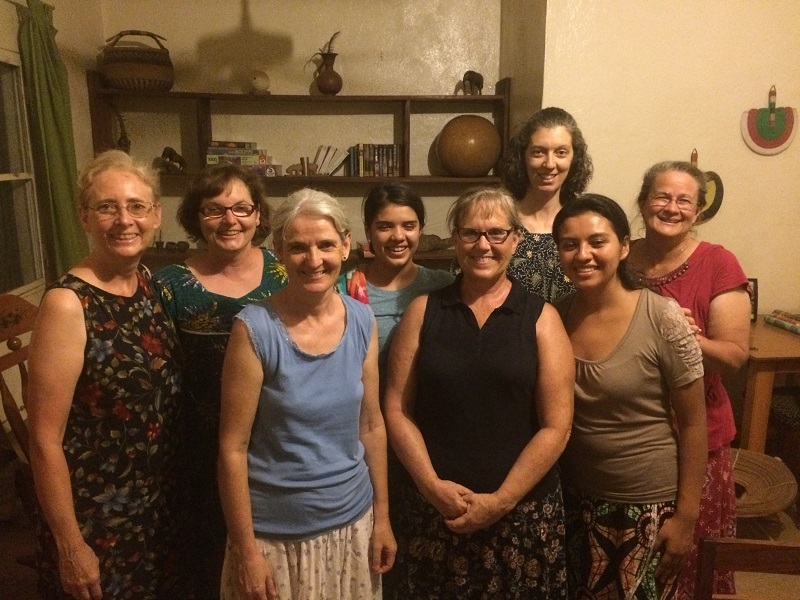 Bekki and Diana with the Moundou ladies Bible study group. What an inspiration and blessing these women are. Before we moved to Africa one of the most frequent questions we received was, “How long will you be over there?” The quick and easy answer was five years, because that is the “standard” General Conference mission term. But there is no contract, it is not like Cinderella’s coach, at midnight 5 years from when we arrived in Africa our house turns into a pumpkin and the lizards, well they stay lizards. It is not like that at all. Really the only stipulation is that if you leave before 2 years the GC won’t pay to move your things back home. It really is a pretty fair deal. The real answer to the question was a bit more complicated, because we really didn’t know, and still don’t know. We felt called by God to come here, so we figured we would stay here until we felt He was calling us to go somewhere else. Which can be a bit tricky. It’s not like He is going to call me up to a mountaintop somewhere and tell me His plans, we also don’t have a working Urim and Thummim, (we actually don’t have non-working ones either), and being on malaria prophylaxis we aren’t trusting our dreams for anything. But we figured He would let us know in His way when it was time to move on. It really came as a surprise when last November it became clear to us that now was the time. We felt like we had just hit our stride here. We had lots of plans, finally knew the ropes, Bekki had just finished decorating the house. God started slamming doors and windows closed faster than you can say “Rainy Season”. Also just as quickly the doors and windows opened for us to go to Waterloo Adventist Hospital in Sierra Leone. And so, although we didn’t receive a handwritten note, or a vision, or an angelic visit, we just knew it was the right thing to do. And now as we wind things down here in Moundou we are just as certain that we are following in God’s path. In my last post I wrote that the future of CCAM is now in the hands of the Tchadiens themselves. They have been trained, they know what to do and how to do it. They just need to work together, put into practice what they have learned and they will do fine. Now I would like to turn your attention to the future, to Sierra Leone, to Waterloo SDA Hospital. For starters Sierra Leone is English speaking. Freetown, the capitol, was settled by freed slaves from England and the US. As more slaves were freed and repatriated there were dropped off in what was to become Sierra Leone. It is not a large country, and is on west coast of Africa. Freetown is on the third largest natural bay in all of Africa. The climate is more tropical and less sub-Saharan. So although it is humid, the temperature stays in the mid 80’s (25 centigrade), with a gentle ocean breeze. Waterloo is just outside Freetown and only a 30 minute drive to the ocean beaches, which considering it is hot season here in Tchad sounds really really good right now. The country is rich in resources, but went through a 10 year civil war, and was just getting back on it’s feet when it was hit by the Ebola crisis. So it is very poor, like most of West Africa. Waterloo Adventist hospital was opened in 2002. It has been run by the Sierra Leoneans since it’s inception. They have never had a western missionary. During the ebola crisis they were an ebola treatment center and actually lost two staff members to ebola. Since then the hospital has been rebuilt and re-opened as a small district hospital. They have one young general medical officer (like a nurse practitioner or PA) trying to keep up with the medical care and even doing some simple surgeries. 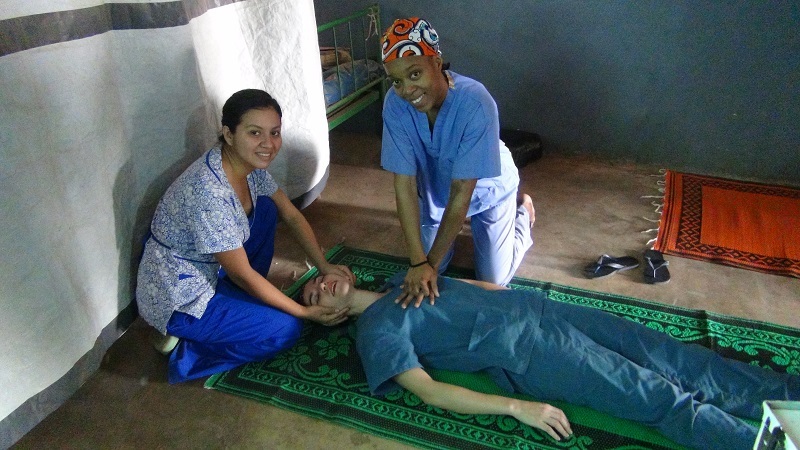 They have also invested in the future by sending a young Sierra Leonean physician to a surgical residency. He plans to return in two and a half years. About three years ago, Donn Gaede, a professor in the School of Public Health at Loma Linda University took over as board chairman of the hospital. He has helped guide it along, especially as they went through Ebola. He told me the team they have there is the most faith based team he has ever worked with. He also told me they have been praying for a surgeon for 3 years. It is always cool to be an answer to someone’s prayers. Since my last post several people have asked what we will be doing there. First off, I won’t be board chair and director of the hospital. I have made it quite clear I am not coming to Waterloo to take it over, or to be the big boss. I am coming alongside the team that is already there and working, to help, counsel and, along with Donn, guide them a bit. As the only physician I will be medical director, but I am OK with that. My main job however, is to develop a surgery program for them, get their OR up and running, and properly equipped, all in preparation for the return of the young man currently in his training. The plan is that he and I will work together for a bit before we head off to our next adventure. The team in Waterloo plan on putting Bekki to work in the hospital. How that plays out we will see. What I am sure of is that she will be busy and be a huge blessing to the staff, patients, and community. And for you, our dear readers and friends, we will have lots of opportunities for you to participate with us in this new chapter of our lives. We will desperately need your prayers. Right now we are enjoying the fantasy of a tropical paradise with cool ocean breezes, virgin daiquiris and streets paved with gold and lined with diamonds. On April 1 reality hits. We have no doubt huge challenges await us. Sierra Leone is right now poverty stricken, so I am sure there will be lots of indigent patients who need care, and need help paying for it, and there will be no change in the two venues for receiving donations. 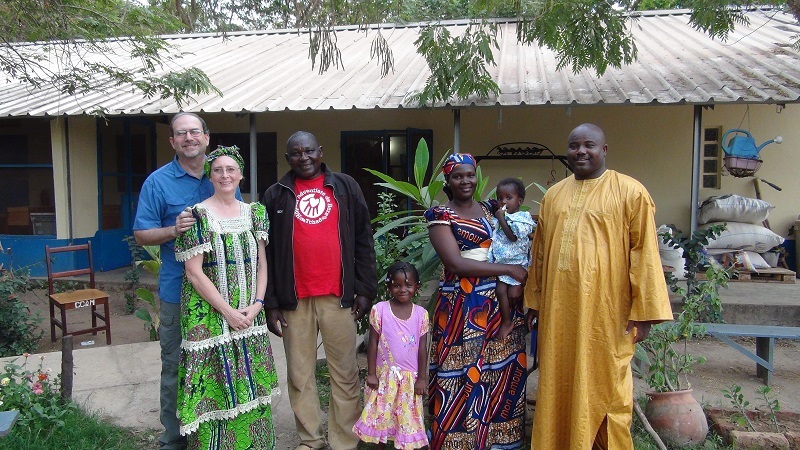 Either through the Clarkston SDA Church Africa Mission fund, or through the AHI website (ahiglobal.org) to AHI-Sierra Leone/Waterloo Hospital. And we will still be welcoming volunteers. For the Americans, you can breathe a sigh of relief. They speak English! For our francophone friends, it will be a great opportunity to practice your English, plus I will be wanting to speak French to you anyway (I am really going to miss that part of it). So nurses, doctors, physical therapists, PA’s, NP’s, dieticians, students, lay people with interest in missions, outreach, and community health, start thinking about a mission trip to a tropical paradise. I promise we will take you to the beach at least once. 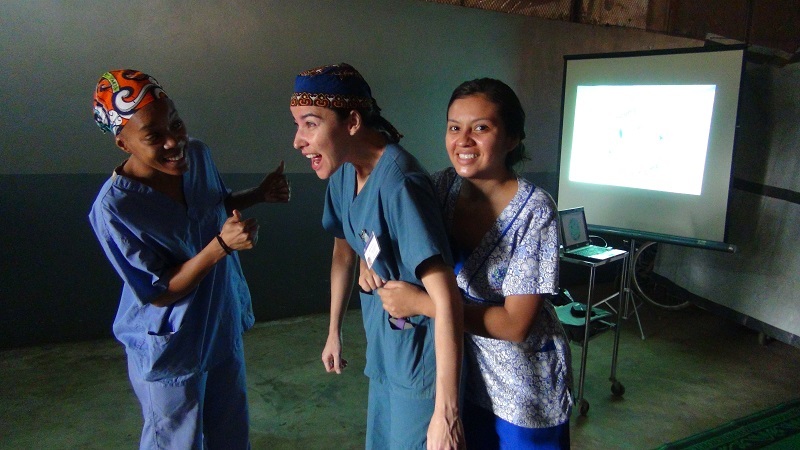 That is Laure doing chest compressions on Patricia, with Diana demonstrating the jaw thrust and airway management. Now Laure is supervising Diana doing the Heimlich on Patricia, don’t know why Patricia was always the victim. Ceremony is very important in Tchad, just like it is around the world. Holidays have traditions, ceremonies, parades, feasts. Here though instead of turkeys being slaughtered by the millions before a big event, it is goats and sheep. I will never forget driving by the market the day before a big Muslim holiday and seeing a goat or sheep (couldn’t see the tail) sitting up on the gas tank of a moto, with his front feet on the handlebars, wind blowing his ears, looking all around with the biggest grin you can imagine on his face. I could just imagine what he was saying to all his livestock buddies. But I digress, ceremony is very big here. And whenever there is a change in power or authority there is an official ceremony, the “Installation.” Pronounced the French way. And there have been a lot of them lately. Our Union committee, which oversees the work here just appointed three new officers for the Seventh-day Adventist work in Tchad. 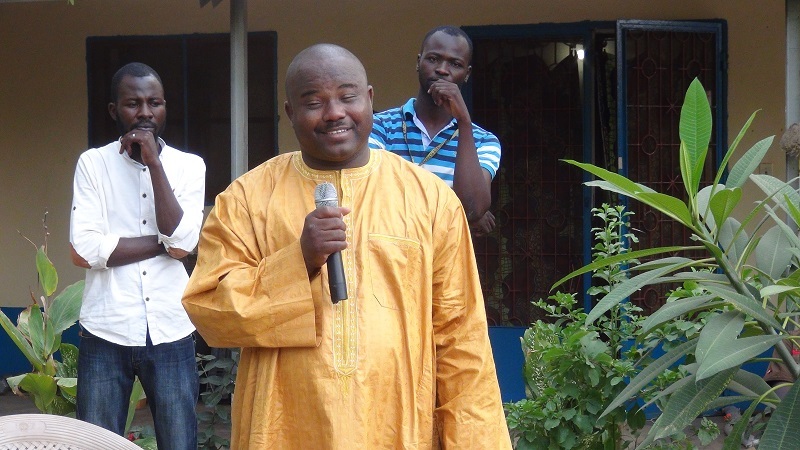 Well, it turns out he picked our Pastor, Dieudonne, from Moundou to be the new President. I think it was a very good choice. Dieudonne has a heart for evangelism. Only an evangelist would give the morning worship talk at the hospital on the seven trumpets of Revelation. All the leaders of the churches and institutions in Tchad were of course invited to the high Sabbath in N’djamena for the big installation ceremony of the new officers. Unfortunately, I was invited as well, and since Dieudonne was our pastor here in Moundou, and since he was on our hospital board, and since he named his first born “Dr. Scott”, I really didn’t have much choice but to go. I tried to get Bekki to come with me. I pointed out the long 8-9 hour drive over a road with potholes bigger than the car, sleeping on a lousy bed without our fans, attending a very long, hot crowded church service completely in French so she won’t get anything out of it. Then after another lousy night’s sleep, returning to Moundou the next day with another 8-9 hour ride over the same road. And since they use the entire road, without distinction to lanes, it really is the same road. That offer was opposed to staying in Moundou, where it is typically 5-10 degrees cooler, and have a girl’s weekend with the girl volunteers who were coming down from Bere. Despite my arguments she chose to stay in Moundou without me. That is what our marriage has come to after almost 34 years. So I went by myself. She blew it, the temperature was relatively cool. I got to spend quality time with Olen Netteburg, who also was alone, and we sat on real plastic chairs instead of the backless wooden benches we have in Moundou. As I said, the change was a good thing in my opinion. It is a new opportunity for the church here in Tchad. The relations between missionaries and church administration have never been stronger. But the temptations for the new leaders are great, and they will need much prayer and support. Tuesday evening, March 1, starting promptly at 4:00 pm (1600) we had our own installation ceremony here at CCAM. It was a very nice ceremony, with speeches by President Dieudonne, our administrator, David, and the administrator from the Hospital at Bere, who was there to represent Olen. The ceremony was to install a new Medical Director for the Center. Dr. Odei, a young Tchadien physician is taking my place as medical director here. We also installed Samedi, the nurse/surgeon, who has covered for me when I am absent the last two years, he will be the head nurse and surgeon for the Center. For the month of March I will stay on a Director of the Center. 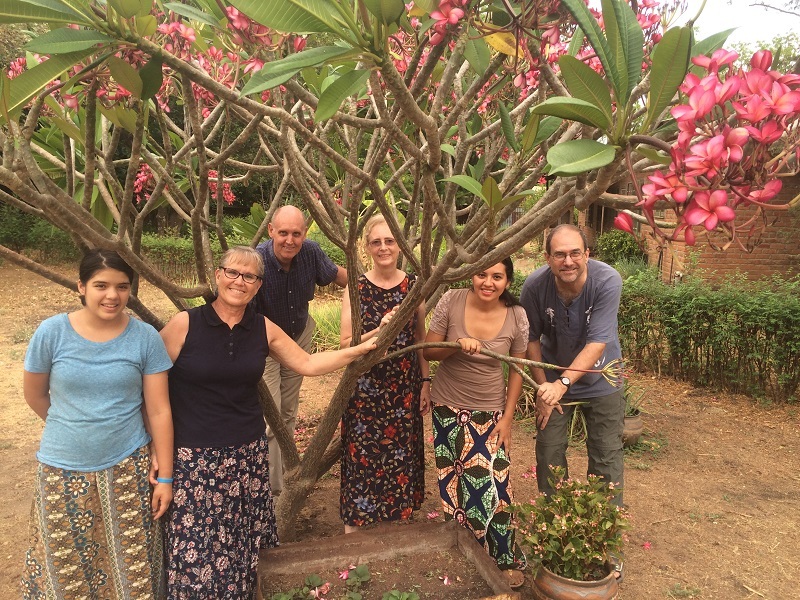 The first of April, James Appel will resume his position as Director of the Center, although he will remain at his work in N’djamena and come down periodically to operate and direct the work here. March 28, at 5 am (0500), Bekki and will be leaving Tchad and heading to Geneva, Switzerland where we will work on obtaining our visas for Sierra Leone. By God’s grace we will land in Freetown, Sierra Leone Friday morning April 1 at 4 am (0400) to begin our work at Waterloo Adventist Hospital as medical director and Surgeon of that facility. In an interesting quirk of fate, last September at the AHI meetings in Abidjan, Ivory Coast, we met the leadership team from Waterloo. Bekki saw pictures of the hospital and the surroundings, and told them and me that she could be very happy there. They picked up on it and told us they had a place just waiting for us. It was all done in good fun, little knowing that in just a few short months we would be moving there for real. 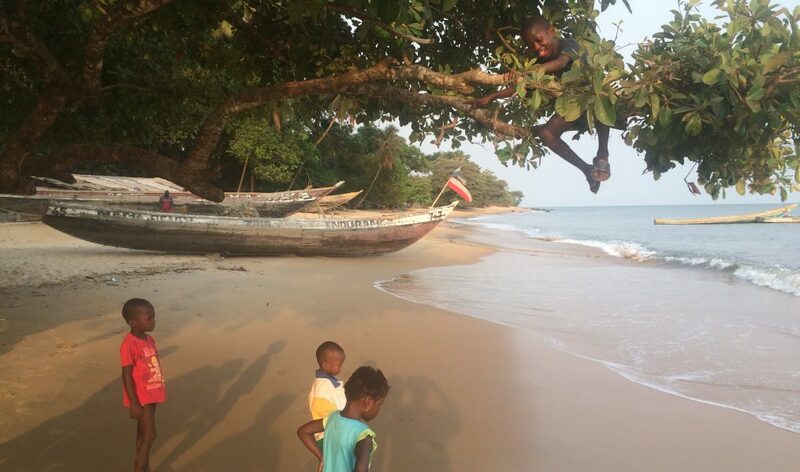 The decision to leave Moundou and relocate to Sierra Leone has not been an easy one, and there are of course many reasons. Our decision was made after meeting with General Conference leadership in Washington, DC, and spending much time in prayer and reflection. We laid out the proverbial fleece, and received what we believe to be an irrefutable answer. Just as we were confident of God’s calling us to West Africa initially, we are equally confident that He is calling us to join the team in Waterloo. As I told our team here in Moundou during my speech at the installation, this is the threshold of a new age for the Center, it is time for the Center to be led by Tchadiens, and for Tchadiens. They have been well trained, they have the tools, now they have the opportunity to run with it. Although CCAM, like every other health care institution in the world, has tremendous problems and challenges, if the staff here are faithful to their calling and purpose, if they hold firm to their belief in their God, if they rely on Him, if they follow His leading, all will be well. We will miss our staff here terribly, we will worry about them, we will pray for them, but ultimately it is now up to them. Dr. Odei, the new medical director giving his acceptance speech. David our administrator is behind and on the left, Masra the MC is on the right. The Old and the New. Bekki and I on the left, Papa Samedi, our new head nurse and surgeon, Dr. Odei and family on the right, Rachelle, Abigail, and Baby Josephine (Jo-Jo). This is along the theme of a couple of posts ago, things are different here. A good case in point is our last staff meeting. Not like any I have ever attended in the US. We had our first staff meeting last week in the pediatric ward, which is serving right now as the salle de reunion (meeting room) and storage room. Unfortunately the electricity is not hooked up there so it is a bit dark inside, lit only by the ambient light. Which also means that David and I, who sit in front facing the staff and students are looking toward the open door with bright sunshine pouring in. It gives everything a surreal unearthly glow, and if someone happens to be standing in the doorway it looks like either an angel or alien, depending on your current point of view. After prayer, I as medical director and chief honcho have the floor. Sometimes I attempt to do some teaching, sometimes I say nothing, sometimes just a bit of counsel. Today I had more important things on my mind, shoes. Yes, shoes. It is a requirement to remove your outdoor shoes before entering the main building where the consultation rooms are, and the Salle de Reveil (ICU, ER, PACU), and OR are all located. This is not cultural, it is about the nurses not wanting sand tracked in on the tile floor and having to clean it more than every other day. So everyone removes their sandals (and maybe a couple of tie up shoes) outside the door leaving them outside before entering. Those of us who spend a lot of time in the building have “indoor” shoes that we wear. I keep my indoor shoes locked up in my office as they have a way of disappearing if I don’t. Now, apparently in Tchad sandals are common property. The unwritten code is you can take anyone’s sandals as long as you return them. I don’t buy into this code. I don’t want to wear anyone else’s sandals and I don’t want anyone else wearing mine. And it is not a racial or hygiene thing. It is a practical thing. When I need to leave the building, I want my sandals where I left them, so I can leave my indoor shoes in my office. One time someone took only one sandal. I was not happy, but had no idea who to blame, so I kept my cool and kept my eyes open. Sure enough the next day the wandering sandal reappeared. I have no idea where it had been, I really wished it could talk. So in the past I have even kept my outdoor shoes in my office as well to protect them, and I have made enough of a fuss that no one takes my shoes anymore. One of the reasons my sandals are protected is I have the only Wal-mart specials on the compound. No one else has sandals like them. I tested this theory the other day, I wore different sandals to the office. Sure enough, within two hours they were gone, only to reappear an hour later. So I went back to my Wal-mart specials which are more comfortable anyway and obviously more secure. That is until Wednesday. I went to leave the building. No sandals. I was not happy. Fortunately, where I was going wasn’t urgent so I could occupy my time doing something else while I waited for the sandals to come home. I didn’t have to wait long. Some hapless new stagiere (nursing student) had chosen the wrong sandals to slip on. So I firmly told him it was not cool to wear the doctor’s sandals, and don’t ever do it again. We have a new crop of students, so I figured staff meeting was a good time to give them the sandal lecture. First I made sure everyone had their own sandals. They did. Then I clearly, kindly, and firmly explained that they should wear their own sandals and not someone elses, and if I caught any of them wearing my sandals (and in fairness I held up my sandal and showed them my unique brand), they would regret it. In my attempt at French, I could have told them that if they took my bra I would snap them with it, which would also be true, by the way. Following this important notification, we had a lively discussion on the subject of a previous blog. Patients who want their blood to take home with them. The staff had no more ideas on how to deal with it than I do, and it is their culture. All they could come up with is, “That is just the way they think”, duh. We then moved to a request from the night nurses for winter coats because it is too cold. Now in their defense, it is cold at night. We are even using 2 blankets (granted they are thin), and I often wear my fleece in the mornings. It gets down to 70 degrees (19 centigrade) by early morning, darn cold. I have even been wearing socks to the office some days. The problem is if we buy a coat for one we have to buy a coat for all, that is just how it is done here. So for now we are ignoring the request, figuring they can buy their own. I thought about just buying one coat that they could share, but if we had one big enough for the two female nurses, pour little Service, the only male night nurse, would drown in the thing, we would have to send in a search party to find him in it. Our final discussion revolved around Felix one of our housekeepers. Felix is a cute little guy, small by Tchadien standards, and usually pretty quiet, but he was really worked up that morning. He doesn’t know much French so he talked in Ngambay. The students and staff were laughing at what he was saying, but he was serious as a heart attack. He probably went on for 10 minutes. The problem-well, you see for many Tchadiens the whole world is their toilet, and they just don’t see the utility or purpose of a concrete room to potty in. There is lots of great sand just outside the wards and along the walls. So despite all the signs and threats of fines, patients and family members pee and poop wherever they want to. This is much to Felix’s dismay because he is supposed to keep the place picked up and tidy, and well, this adds layers of unnecessary difficulty to his job. But when all was said and done, and we have gone around this barn before, “It is just the way they think”, and we ain’t changin’ it.